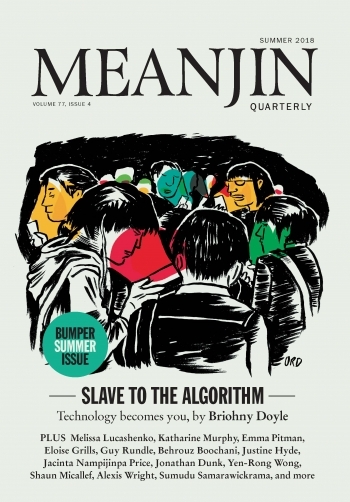 There’s always a lot to read in an issue of Meanjin and its Summer 2018 issue is rightly labelled ‘Bumper’. This reviewer skimmed and dipped and found the following gems and nuggets. A propos of ‘bumper’, cricket leads the way with Shaun Micallef’s amusing (and presumably not apocryphal) encounter with Don Bradman, closely followed by Geoff Lemon’s attempt to make sense of Sandpapergate. When the latter scandal broke, this reviewer assumed the identity of former Australian captain, Bill Woodfull, the epitome of cricket as it should be played, to send a despairing email to an old friend and cricket buff, whom I addressed for the purpose as ‘Dear Don’. My old friend was obviously grieving (as I was), did not see the irony, and did not answer the email. Then there is Eliza Berlage’s inclusion of Mem Fox’s Possum Magic (1983) in her listing of ‘Australia in three books’. At a time when our family is digging out old books for the use of Grandchild No. 1, this was a particularly apposite choice by Ms Berlage. (One of our daughters is still called ‘Poss’.) Now where on earth did we put the book, though? Katharine Murphy has a thoughtful piece on the downfall of Turnbull, from which emerges a memorable image of a young male staffer who ‘wept at the finality of things, at the brutality of the coda’. However feckless Turnbull may have been as PM, he evoked loyalty – or was the staffer just struck by what Paul Keating at a similar juncture described (and mispronounced) as ‘the poignancy of the moment’? It will be interesting to compare Murphy’s take on the Turnbull exit with the much longer essay by Pamela Williams in the latest issue of The Monthly. Barry Corr, Melissa Lucashenko, Mark McKenna, Emma Pitman, Jacinta Nampijimpa Price and Alexis Wright all offer pieces on aspects of our shared – including our Indigenous – history and lay down important markers. Lucashenko counsels her ‘fellow Murries, Goories, Koories, Nungas, Noongahs, Bama and Yolngu’ to be conscious of their differing stories. Corr agrees, quoting Terry Eagleton that ‘Truth … cannot be the private property of individuals’. McKenna, writing about an Indigenous story, makes the important general point that what one extracts from the past varies from time to time, depending on mood and circumstance. ‘It was yet another reminder of the subjectivity of my “reading” and interpretation of historical sources.’ Pitman, dealing with sexual assault and family violence, allows herself ‘to imagine a world where everyone at the top of their hierarchy takes ownership of disassembling it’. Wright suggests such rethinking would benefit from immersion in Aboriginal story-telling. Elsewhere in the Bumper issue, immigration detainee Behrouz Boochani and his translator Omid Tofighian show us something of how Boochani’s book No Friend but the Mountains came about. (Update 1 February 2019: The book won the $100 000 Victorian Prize for Literature.) That was story-telling under the greatest stress. Yen-Rong Wong tells of a different form of stress – how Chinese Australians bend and distort themselves to be seen as ‘a model ethnic minority’ yet are still seen by white Australia as ‘second-best, sub-par citizens of a country that is not rightfully theirs’. What else? Briohny Doyle and Mandy Ord depict dealing with technology as wrestling with successive generations of a time machine. Shannon Burns muses about forms of shame. There are ten poems and six pieces of fiction. Guy Rundle remembers 1980s Melbourne (or at least the part of it within sight of the Raymond Priestley Building). Look no further than the impossibility of balanced discussion around our two most conflictive national dates: 26 January and 25 April. These are no longer sites inviting analysis, but are the cue for open-invitation slanging matches, marked by radicalised and entrenched positioning and the sloppy use of historical argument. The bugle [at the daily Last Post ceremony] reverberates to silence and our eight-year-old looks up and says, “Why are you crying, Mum?” He has a sense of why but wants to talk about it more. This isn’t the time. It’s enough for now. I reckon our boys will continue to lightsabre bad guys and blow up Lego bases but I think it’s good they see their parents cry. That memory will last. We’ll keep explaining why wars start. We’ll encourage curiosity. Emotion followed by questions. That’s good. The Memorial should ask more questions and encourage its young visitors to do the same. That’s something else to take away from this highly nutritious and thought-provoking Meanjin. * David Stephens is the editor of the Honest History website and co-editor of The Honest History Book. As it does in the After the War exhibition.